Brampton Place, previously an agricultural centre before being built over. We live in Pickford Lane quite near to the shops and Railway Station. Today it is a bustling parade of shops and the very busy Station takes hundreds of daily commuters to work in London. Pickford Lane is a busy thoroughfare giving access to Crook Log and the Broadway with several bus routes for those not using one of the many cars on the road. The residential properties on either side of the road are a mixture of houses and bungalows. However, it has not always been like this. The 1895 Ordnance Survey map shows a rural area with very few buildings in Pickford Lane – only glasshouses for the numerous nurseries. Brampton Road, which runs more or less parallel with Pickford Lane, is shown to have two large properties, Brampton Place and Brampton House. 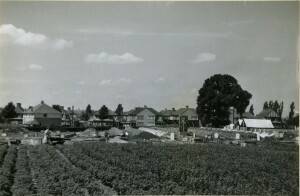 The photograph above shows the area behind the house called Brampton Place which was an agricultural area between Brampton Road and Pickford Lane and was built on with Bungalows and houses to form Orchard Avenue, Bowyer Avenue and Shakespeare Rd.